Getting banks under control is a matter of politics, not individual consumer decisions. “Treasury. 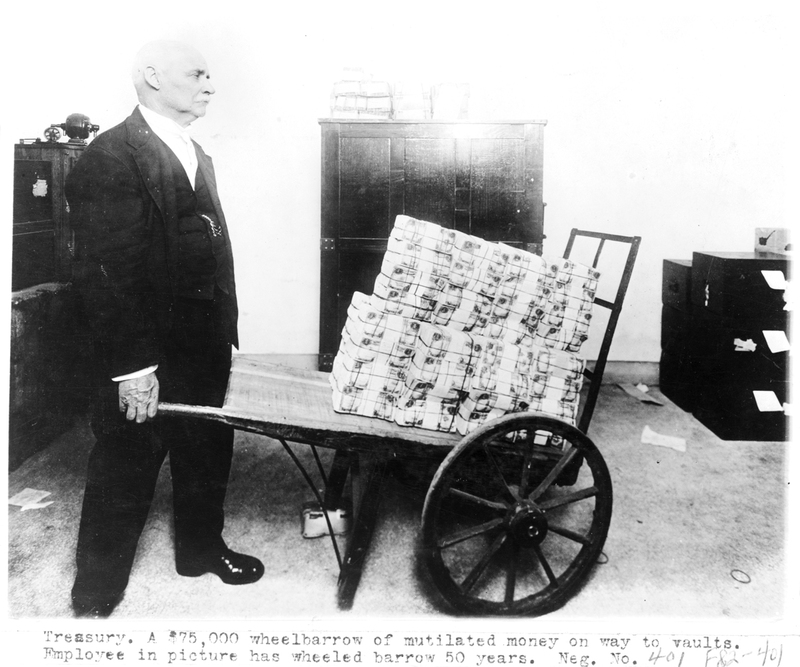 A $75,000 wheelbarrow of mutilated money on way to vaults. Employee in picture has wheeled barrow 50 years.” — National Photo Company Collection / Library of Congress. There’s a brand of populism, on both the Left and the Right, that sees the problems of capitalism — like the polarization of rich and poor and the system’s vulnerability to periodic crises — as primarily financial in origin. While this tendency has a long history, and pervades a lot of the pseudo-radical tradition in the United States, it always achieves special prominence at the time of financial crises. To reprise for a moment before taking on a fresh eruption of the syndrome: capitalism is a system organized around money. Almost nothing is under-taken in the realm of production for reasons other than the accumulation of money. As the money accumulates, something must be done with it, which is why financial wealth expands over time. But even though that financial wealth often seems to inhabit a world of its own, it is ultimately connected to what Wall Street calls the “real” sector. For example, all the mortgage securities that caused the mischief that led up to the 2008 financial crisis were ultimately connected to one of the most basic needs of all, shelter. There is no way to separate neatly the monetary from the real. The social problem emanating from the securitization of mortgages isn’t only the increasingly baroque development of financial assets but also the commodification of the house and its transformation into a speculative asset. Which is why populist financial reforms can’t take you very far: they address symptoms, not pathogens. But that never stops people from trying. After the crash came Arianna Huffington’s “Move Your Money” campaign, which would have those of us with money in large banks move it to small ones. This touches on another foundational populist fantasy: that virtue and size are inversely related. Her website, which long thrived on the unpaid labor of hundreds of eager contributors, even provides a helpful list of convenient local banks if you enter your zip code. What’s wrong with this scheme? Several things. First, many small banks have more money than they can profitably invest locally. As Barbara Garson shows in her wonderful book, Money Makes the World Go Around , the portion of her book advance she deposited in a tiny upstate New York bank was probably lent via the fed funds market to Chase, where it entered the global circuit of capital. This is not at all uncommon. Money is fungible, protean, and highly mobile even when it looks locally rooted. That very mutability is part of what makes money so valuable: it’s the ideal form of general wealth that can instantly be turned into caviar, lodging, a Swedish massage, or shares of Google. The point can be further developed by looking at some of the banks that Huffington’s site recommends. Entering my zip code, 11238, into their helpful little machine yields several suggested receptacles for one’s savings. One, the black-owned Carver Federal Savings Bank, is a major financer of the gentrification of predominantly black neighborhoods in Brooklyn and Queens. As those neighborhoods get richer, Carver boasts, it’s partnering with Merrill Lynch (a subsidiary of the Bank of America) to offer wealth-management services to the flusher new residents. Another suggestion, Apple Savings Bank, has about three-quarters of its assets in securities like US Treasury bonds, not local loans. They don’t come much bigger than the US Treasury. And a third, New York Community Bank, which even features that precious word in its name, financed a private equity group that bought up a lot of apartment buildings in New York in the hope of squeezing out the rent-regulated tenants and replacing them with more lucrative ones paying market rents. With the real estate bust, the private equity firm is having trouble servicing its debts, and the residents of its buildings are suffering as services are cut further. Yes, there are some decent places to park your money, like community-development credit unions. But there’s only so much they can do with their holdings. There’s no way they could accommodate even a small fraction of our near-$8 trillion in bank deposits without turning to Treasury bonds or Merrill Lynch wealth-management services. Getting banks under control is a matter of politics, not individual portfolio-allocation decisions.